Mark Bittman’s recipes are the focus for this week’s menu planning perfect for busy days or weekend gatherings and so a recipe for Asian style chicken wings. 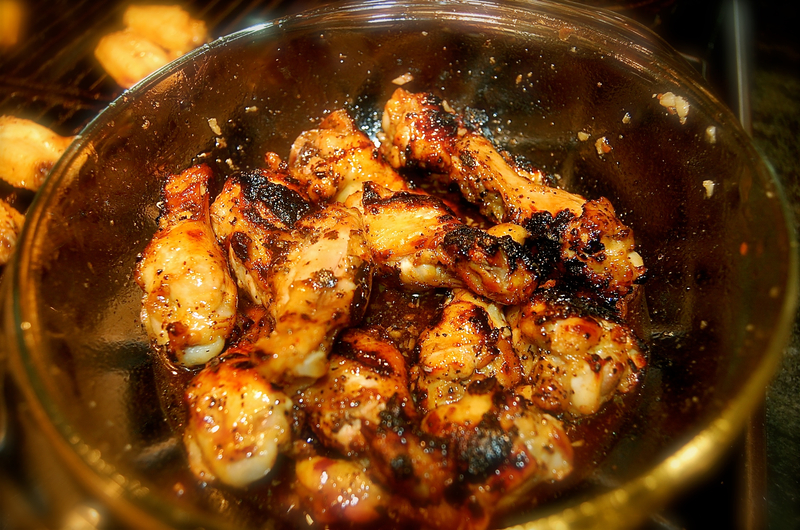 Mark suggest just black pepper and garlic wings, but of course taking it a step or two further, I stove top smoked the wings for about 20-25 minutes with the handy-dandy Nordic Ware smoker and finished them on the range top grill. You can of course follow his instructions for indirect grilling and finally direct heat grilling, but I am in the middle of cleaning out the pantry and it is nothing to smoke the wings and then finally sauce them and grill before eating. I changed things a bit like trimming the wings early in the day and seasoning with the black pepper and minced garlic, refrigerate until ready to smoke or grill. Make the Fish sauce and refrigerate until time to grill. * Note: I doubled the adapted sauce and divided one bowl for a brief 20-30 minute marinade after smoking and grill basting and one bowl for the finished wings to dip again before serving.